This design was formed with a tiny, early-spring leaf from a grape vine which surrounded the property where we lived for twenty years! Those vines produced large leaves for elegant Lebanese cuisine, and by late summer were studded with more grapes than we could use, sell or give away! 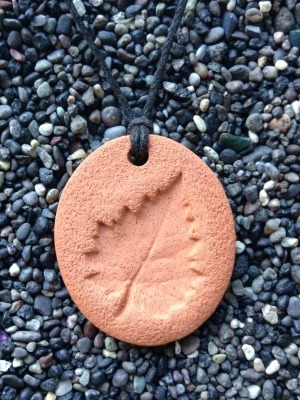 The Grapeleaf Pendant measures 3.25 cm by 3.75 cm (1 ¼ by 1 ½ in).